Taylor originally chose Boston College this summer but said (on the link we posted here) those plans didn’t work out. Xavier came into the picture soon afterward, and he gave his commitment after visiting the school this weekend and talking things over with his family. He said he chose XU over Cincinnati, Miami U. and Arizona State. Maybe we can finally put an end to this odd chapter both in this young man’s life and in Monmouth University men’s basketball history. JerseySmarts.com wishes Taylor luck at Xavier University. And we’re really looking forward to getting back in the MAC Center for the coming basketball season! Frankly, folks, this is remarkable. Former Monmouth University men’s basketball player Travis Taylor was supposed to be heading to Boston College to play basketball in the fall. Well, the word on the street is that the plan to go to BC isn’t going to happen after all. Below is a portion of an entry from The Hawks Nest blog which talks about the reason why the plan wound up falling apart. 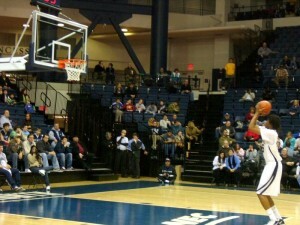 Former Monmouth forward Travis Taylor is now back on the market and won’t attend Boston College. I’m hearing BC wasn’t aware that Taylor had been suspended for seven games last season for “violating team rules.” Really? How do you not know that? Anyway, the 6-foot-7 Taylor, a Union, N.J. native, will visit Xavier Tuesday and is also considering Miami, Cincinnati and Arizona State. Taylor averaged 17.8 points and 7.6 rebounds last season. Wow. I have a few comments on this new story from The Hawks Next. First, at this point I’m not sure if this information is confirmed or strong speculation, so it might be best to label it as allegedly true instead of known fact. Hey, we all thought that Taylor was heading to Boston College, right? This is very sad- Ego’s is what this move is all about. The damage that his mom and mentor have done to this kid is unbelievable. Has far as taking him back to MU – No Way!!!! He, his mom and his mentor have burn that bridge. This is what happens when people who think they know college basketball get a hold of a kid. they screw it up almost always. Look, I don’t know what the core reason was for Taylor wanting to leave Monmouth. There were rumors that Dave Calloway’s coaching style was too aggressive for most of the players and that he treated them like kids rather than young adults. Who knows if that is true other than the players? The comment above suggests that Taylor’s Mom wanted him out of the program – who has anyway of knowing if that is true besides Mrs. Taylor and her son? Was it Taylor’s “mentor” that brought the Mom and son delusions of grandeur? No one can know for sure. What we do know at this point is this: Taylor was suspended for seven games in the middle of the season for violating team rules. The rumors suggest that it had something to do with smoking some weed, which was a very poor decision on Taylor’s behalf as it negatively impacted his teammates during the season, the health of his team after the season ended, and his own character in the college basketball world (as the Boston College story above represents). What we can all, I think, safely speculate at this point is that this was a tremendously bad decision on Taylor’s part and that it probably wasn’t worth the few hours of a high that he may have received from smoking up. Then again, are we now expecting college kids to consistently act with the type of responsibility that we expect from ourselves as adults? I sure hope not because the vast majority of college kids don’t take into account what impact their actions have on tomorrow, let alone what impact those actions will have on their character a few months afterward! Former Monmouth forward Travis Taylor has opted to transfer to Boston College and play for former Cornell coach Steve Donahue. Taylor chose the Eagles over Seton Hall and Temple. 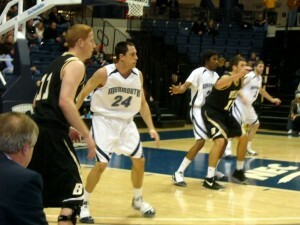 Monmouth gave Taylor a conditional release, allowing him to move to schools not on the team’s 2010-11 schedule. Seton Hall is not on the schedule, while Rutgers is. Taylor has not answered several calls to his cell phone. He was suspended for seven games last season for “violating team rules” and the team went 2-5 during that span. From my perspective, I’m really unsure about this move in terms of being a benefit for Taylor. In the NEC he stood out as clearly the best player on his team, but also as one of the best players in the league. Moving up north and into the Atlantic Coast Conference is a whole new world – I’m not sure how Taylor will be able to perform up there, but I guess all that anybody can do is wait and see, right? “Maybe if I felt different about the game of basketball I would buy into everything,” Sofman said. Sofman said Calloway is not out of the ordinary in how he handles players from any of his other coaches dating back to high school. I have mixed feelings on Sofman leaving the team because I think that he is a good player and a great asset to the team on many fronts. However, as a former high school athlete (and a pretty damn good one, too), I absolutely understand that feeling of completely losing interest in a sport in which you were once a fierce competitor. Story Time! When I was in high school I was a pretty good wrestler. I wasn’t state championship material by any means, but I was pretty damn good. However, somewhere in the middle of wrestling season during my senior year in high school I began to really not give a damn about the sport any more (which was pretty bad since I was Captain of the team). I definitely continued to compete at a high level, but I didn’t want to win for the good of the team or for my personal advancement; more than anything else I wanted to win matches for personal pride. I’m not sure what caused me to not give a damn any more, but over the years I’ve begun to accept the notions that 1) I saw no professional or semi-professional athletic future for myself and 2) I subconsciously didn’t buy the “hype” that our coaches sold to us on a daily, weekly, monthly, and yearly basis. From Sofman’s quotes above, it sounds like he was in the same situation. When I read Sofman saying that he can no longer take the “culture of it” and that if he “felt different about the game of basketball [he] would buy into everything,” the very same feelings conjure up in my head that I had during my senior year of high school wrestling. Specifically, it’s the idea that you have to “buy into everything” that really piques my interest. Anyone who has played a competitive sport under a good coach at a competitive high school or college knows that coaches all have their own unique motivation techniques. Some yell, some scream, some run you into the ground, some speak softly and carry a big stick – it’s part of their style as a coach. A good coach will tailor his or her motivation techniques to lead his or her athletes to a bigger picture, larger goal, or greater accomplishment. It sounds like Sofman didn’t want to deal with Dave Calloway or his coaching staff’s motivation techniques because he no longer saw the bigger picture, wanted to attain a larger goal, or even believed that there was a greater accomplishment. Again, if this is how Sofman really feels (and we have no reason to doubt him), then I can’t really blame the kid for making this decision. I remember how my wrestling coaches told me that if I wrestled 100 competitive matches (or more) during the off-season that I’d come back better than my competition. So… I did just that. I wrestled over 100 matches during each of my off-seasons. That’s 100+ matches after my Freshman year of wrestling, 100+ matches after my Sophomore year of wrestling, and 100+ matches after my Junior year of wrestling. Was I better than my competition? Ehhh… it’s debatable. There were certain guys that didn’t last 30 seconds wrestling against me and there were other guys that I never beat. At the end of the day and after more than a decade to consider some of these issues, I don’t think that I was any better off because of those 300+ matches that I wrestled in the off-season. I don’t write this stuff as a bitter ex-athlete. Not at all, actually. In fact, I look back on my days as a high school athlete with very happy and exciting memories! But as Sofman says in his quotes above, I’m an adult now and I see the system that I went through for what it really was – a prolonged motivation technique that, for the vast majority of high school athletes, doesn’t help them truly excel beyond their competition. It seems that Sofman has come to this realization, too. In fact, when I read his quote of, “You can’t talk to an adult like that and expect to get results,” I pretty much know that he’s done with these motivation techniques to push him to a greater accomplishment. And I completely understand. All of that said, I’d still encourage kids to get involved with competitive sports while in school. Competition builds a certain character and, while these athletes are young teenagers, the camaraderie of a team helps them to develop the necessary social skills that they’ll need in many aspects of their adult lives. However, when all is said and done I appreciate where Sofman is coming from because I appreciate that sometimes you have to know when to say when. “Travis’ mother contacted me by phone and declared that they have decided that her son needed to move on to further enhance his chances of playing in the NBA,” [Dave] Calloway said. No matter what happens, though, I’ll be back in my seats next season to enjoy some basketball at the MAC Center. I just didn’t think that I’d be watching a completely different team play when only one of this past season’s players (Whitney Coleman) was graduating!